I At the West end of the gulf, close Kurtoğlu Cape you reach Ag Limanı (double bays), which is another secluded bay where you can swim, fish, sunbathe or rest. A Lycian city, ancient Lydae, is easy to reach by a path, taking about an hour. At Bükü, which is located north of Boynuz Bükü, consists of two small bays; Günlüklü and Osman Aga bays. Here again you will find frankincense (liquidiambar oriantalis) and pine trees. Osman Aga bay has also a small beach and a spring water source. Bedri Rahmi Bay is one of the most popular bays in the Fethiye Gulf, which is located opposite Tersane Island (Dockyard) and known as Tasyaka Bay. Bedri Rahmi Eyüboglu was a great writer and painter of Turkey. He and his close friends were the first blue voyagers of the country who discovered the beautiful Lycian coast and informed people about these beauties. On one of his cruises, he painted a fish on a rock behind a fountain of the bay in 1973, and ever since the bay has been called by his name. The bay is well protected against the wind and suitable for anchoring. Pine, olive trees and oleander flowers on the surrounding slopes, small beach and crystal – clear water complement the historical remains on the hill and create an idyllic setting. There are many Lycian rock tombs hidden behind the trees, as well as ones shaped like pigeonholes on a great rock. You can also see a rock tomb with an ornamented door and a triple tomb on the slope. 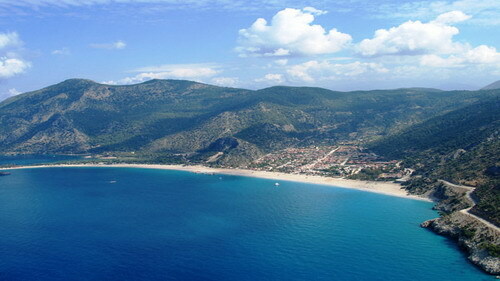 According to the ancient historians, the city that is located behind of the hill was the Lycian town Crya. Boynuz Bükü is located between Bedri Rahmi Bay and Göcek opposite the Yassica Island. It is a good anchor place and very little affected by the winds. When you anchor your boat in the bay, you can see frankincense (liquidiambar oriantalis) trees which are protected by the government. The Island of Pigs is the nearest Island to the peninsula west of the Gulf. It is covered with olive and pine trees. A quay and couple of houses can be seen when you sail along the north coast. East and west of the bay are ideal for overnight anchorages. If you want to cruise in the Marmaris direction from the Fethiye Gulf, it is better to depart very early in the morning and cruise from Kurtoğlu Cape to the Ekincik Gulf when weather and water are still sleeping. The wind in this region comes from the west, contrary to your direction. In Ekincik Gulf, there are many beautiful small bays good for overnight stay, such as Semizce 1 and Semizce 2, where the land completely covered by pine trees. The gulf is busy with yachts coming from Fethiye and Marmaris because it is very near to the ruined remains of the Ancient Carian town Caunos. 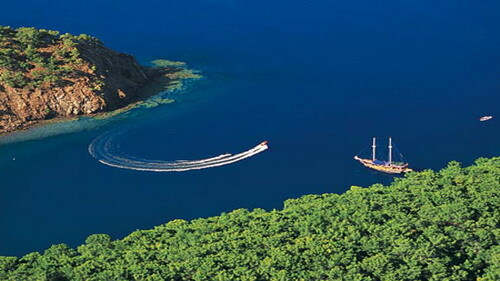 Göbün Bay is the first anchorage when you enter Fethiye Gulf between the peninsula and Domuz Island. The Bay is surrounded with pine and olive trees and very well protected against all winds. Therefore Göbün bay is an ideal place for yachts even during winter. A fisherman / diver; Tahir, runs an excellent restaurant, specializing in fresh fish, and is well known to blue voyagers. Cruising from Göbün and Merdivenli bays you reach the unique beauty of Manastir (Hamam) Bay. The people also call this beautiful bay Cleopatra’s Bath because of the ruined Roman bath lying in the water southeast of the bay. It is certain that there is no relation between the bath and Cleopatra but local people like to say so. The volcanic structure of the natural hillside of the bay also confirms the existence of a crater lake, which gave warm waters to the bath house in ancient times. The pine trees in the bay cover the slopes from the seaside to the top of the hill, where you also see carob trees as well. A long ancient wall stretches west of the bay, seemingly the defence wall of the Lycian city Lydae that is located behind the hill. South of the bay, where the remains of the bath are, is an ideal anchorage spot closed to wind. Merdivenli Bay is located next to Göbün (Kapi) Bay north of Fethiye Gulf. The name of the bay (Merdivenli = stepped) is taken from very impressive steps into both sides of the rocks in the bay. The nearest small village is also called Merdivenli Köy (stepped village). Tersane (Dockyard) is the largest island in Fethiye Gulf. Entry to the harbour like bay of the island is via a deep channel which is also called the winter port of Tersane. The Eastern side of the bay is available for anchor as it is quite shallow and protected from the wind. According to ancient sources, the island was inhabited and named Telandria in the past and was also used as a dockyard for the ships during the Ottoman period. Many houses from past ages can be still seen on the island, which give an idea of the population of the island during the Byzantian and Ottoman periods. As with Kaya Köyü in Fethiye, inhabitants of Tersane Island migrated to Greece in 1922 as a result of an agreement between Turkey and Greece to exchange the foreign populations in the two countries. North of the Island is another anchorage called Summer Port, another nice spot for swimming. 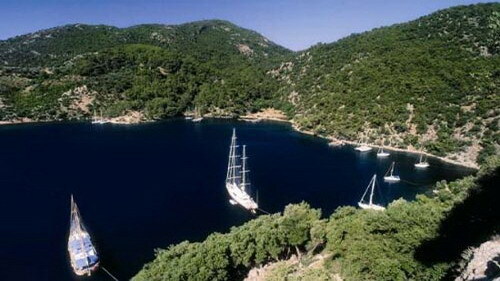 The group of islands called Yassica Islands are the nearest Islands to Göcek. It is a great pleasure to discover the tones of blue from the sea and green from the pine and olive trees when you anchor in the shallow waters close to one of the islands.